Parody of Edward Gorey's Gashlycrumb Tinies, I did this series over the past month or two on my webcomic Doctor Kawaii [link] as a mini series. I love Edward Gorey's art so much, and there are so many people and aliens that die in Doctor Who, that I wrote this out at work on slow day. Enjoy, I had a blast making these. Wow..You idea is really awesome..I bow on you EatToast . Good job! If only this was made in 2016. Fantastic idea! I love this! Awesome! It was very fun reading it! This was great. I remember this book though ... it really, really messed me up. Our sadistic Year One teacher read it to us and I think everyone just went into shock. love this, it's brilliant. two of my favourite things expertly combined. digging the pen work stylings. my only qualm is that i can't get a closer look to take in all of the yummy details! 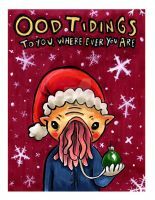 I don't know all of these, but this is a great Whovian take on a classic! OH. MY. GOODNESS. I love you so much for this. And it's absolutely fantastic! Love the original by Gorey so much, and this is just... aah it's perfect! Ohmigoodness. Great job. Great job. I love it, but it's so depressing. However, I wanted to tell you about this game called Gloom. It's a card game based off of Gorey's artwork and books. I thought you might like it. This is amazing. You've managed to take one of my favorite books from childhood (I was an odd kid.) and make it better. Thank you. Is it okay that I'm madly in love with this? 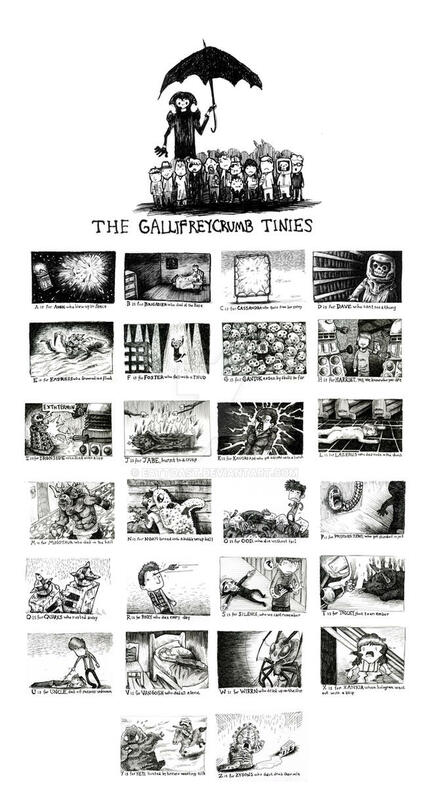 I mean, I have the Gashlycrumb Tinies on my wall and see them every day, and I love Doctor Who....If this was a book I'd buy it. I'd buy it aaaaaaall day. Thank you very much! I'm glad you like it. Books are on the way, they'll be on etsy in a few weeks, I think. MY WISH HAS COME TRUE! Now...what else shall I wish for?! buahahahaha!!! Deviantart prints give such a small amount of money to artists that it isn't worth doing it through this site. I sometimes have book versions at conventions I do though! 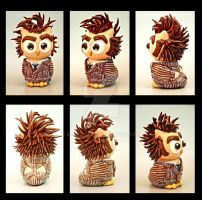 I think the Zygon is cute. The piece is funny and does a great job of covering the whole 50 years (!) 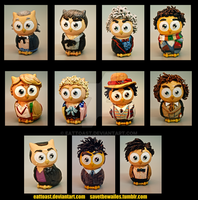 of The Doctor. Thank you so much! It was so much fun to make, but hard to narrow down what to use. I can imagine! So much to choose from!